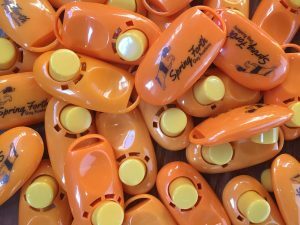 Does the sound of one of these send your dog running for the hills? Read on for some tips to fix that! 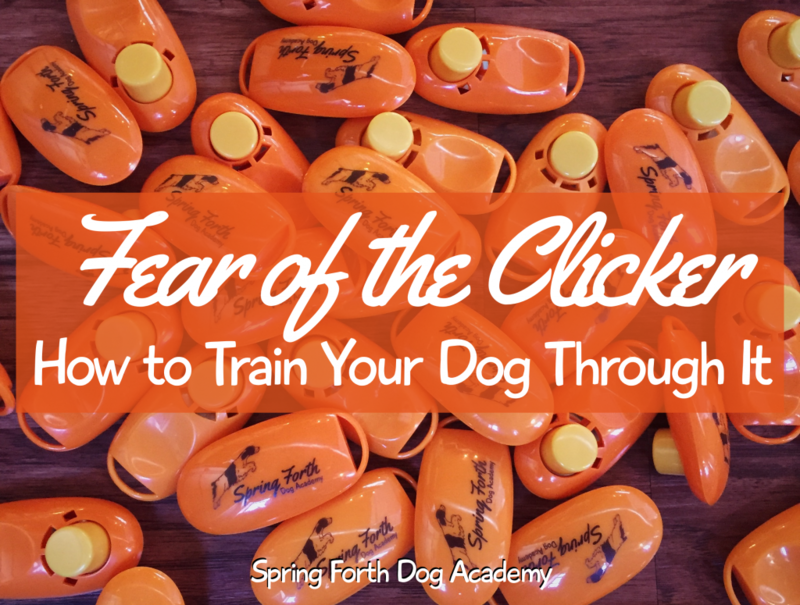 Most dogs take to clicker training like ducks to water! But occasionally, one of our students goes home after Orientation, eager to start the training process with their dog, only to discover that their dog is afraid of the clicker. 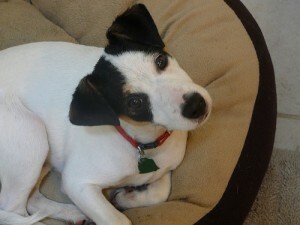 Fortunately, there are a variety of ways to teach a dog that a click isn’t so scary after all. Here are some of the techniques we’ve used to turn this fear around. First, make sure you’re using the highest value treats you can find. This will help all of these techniques work better! Even if the first couple of clicks startle your dog, pairing them with a very tasty snack may change your dog’s mind quickly. Left: a box clicker, which is pretty loud. Right: an i-Click, which makes a softer, quieter click. Unless your dog is scared of being outside, we recommend that you start training outside. This makes the click sound less unexpected. I think some owners inadvertently startle their dogs by clicking in a quiet room when the dog doesn’t expect any unusual sounds. Dogs are used to hearing random noises while exploring outside, so the click sound won’t be as sudden. It is true that you can train using a verbal marker rather than a clicker. 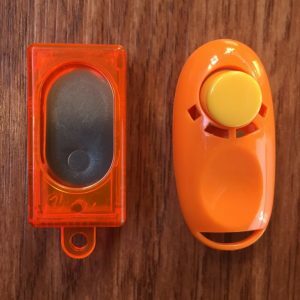 However, some research has shown that using a clicker speeds up the training by about 30%. Anecdotally, we have found a strong correlation between owners who use the clicker and faster progress in training. So, it’s worth trying to work through your dog’s dislike of the click sound. 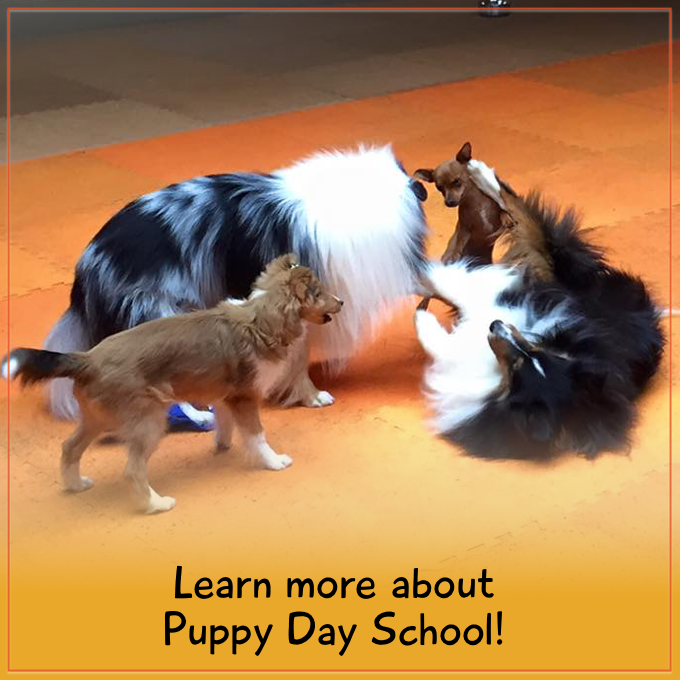 In our Day School program, we go through a lot of dog treats! During our busiest weeks, it is not uncommon for us to use 10 pounds or more. We’re always looking for the fastest and most cost-effective ways to prepare and store this much food in our training studio. When it comes to food rolls, we have this down to a science. We recommend and sell Happy Howie’s treat rolls. Happy Howie’s rolls are way less crumbly than other rolls on the market, which is why they are our favorite. These are 1- or 2-pound chubs of semi-soft dog treats which you can chop up or tear chunks off to give to your dog. 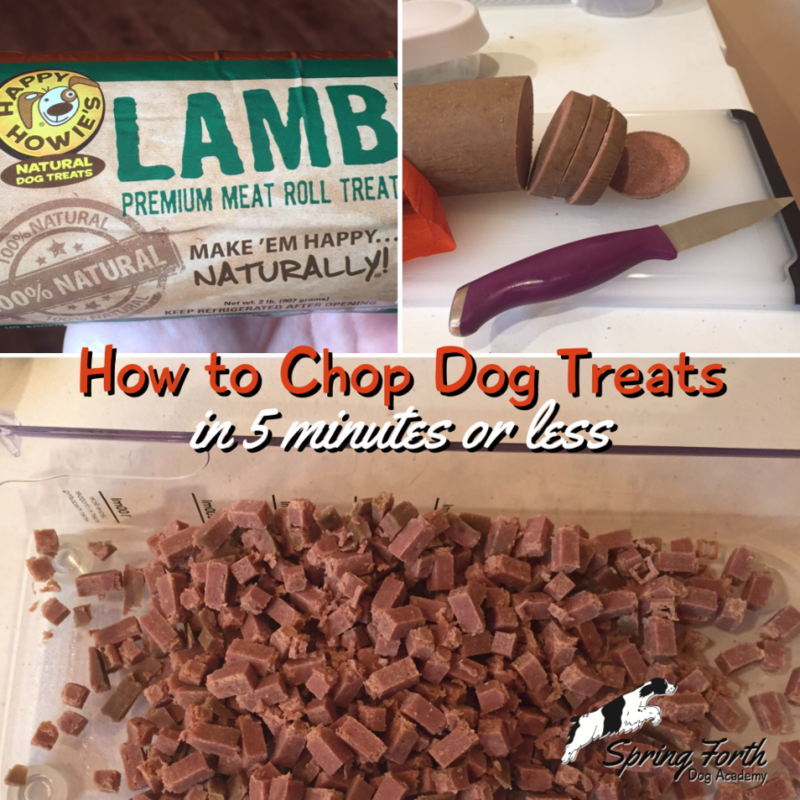 Because you take care of the cutting yourself, these treats are very inexpensive per-pound. Here’s how we process the 2-pound Happy Howie’s treat rolls at the Academy in just 5 minutes or less. 1. Unwrap the roll. While a pair of scissors works just fine to snip the plastic open, we use a pair of large dog nail clippers. 2. Slice the roll into discs. We usually aim for 1/4″ thickness – these are a bit thick. 3. Place one disc at a time on to the cutting portion of your Vidalia Onion Chopper. 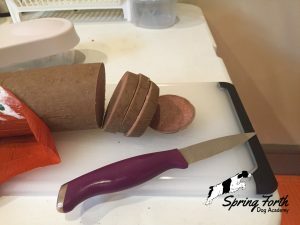 Over the last several weeks, I have written about shaping and luring here on Spring Forth Dog Blog. My next topic is capturing, which is a pretty simple, straightforward way to get behavior! Simply put, capturing involves waiting for the dog to do the ENTIRE behavior you are looking for with no prompts from you, then clicking when he does so. Capturing is the best way to get more of those charming little behaviors that your dog does spontaneously, such as tilting his head or licking his lips. Capturing can also be used to teach a dog to sit or lie down on cue. I do this with some dogs that never offer to lie down in a training session no matter how much luring we try. To capture a behavior, you must keep treats in your pocket & a clicker handy. Observe your dog closely and be ready to click when he happens to do the behavior! Then give him a treat. Chances are, the dog will have no idea what earned him the click and treat the first time, but if you stick with it and continue to watch the dog for more examples of behavior, you will notice the dog doing that behavior more often. I suggest that my students keep a log where they write down when they were able to reward the dog for doing that behavior. On the first and second day, it might only be twice a day, but by the end of a week, they’re capturing it a dozen times a day! Clearly the dog is learning something. Capturing requires a lot of patience as well as good timing from the trainer. Remember: training is a mechanical skill, just like learning to ride a bike or play an instrument. It takes a bit of time to get good at it! Practice your timing and observation skills away from your dog first, before trying to capture a new behavior. Last week I started off my series on “How to Get Behavior” with shaping. Now I’m going to explain a bit about luring and how to use a lure to teach behavior. The term luring refers to the use of a desired reward to coax the dog into achieving the desired behavior. The “desired reward” is nearly always a food treat, but it is possible to lure with toys. Luring can be used to teach many behaviors, including sit, down, loose leash walking, and a lot of tricks. I teach “sit” by showing the dog a piece of food, moving it right in front of his nose, and lifting that piece of food up and towards the dog’s tail. This lifts the dog’s head up and back, resulting in his weight shifting from his front legs to his back legs. Nearly always, this causes the dog to sit. I then click and give the dog the treat. After doing this three or four times, I get rid of the food lure. This is the most important step, yet it is the one that most owners skip! As soon as the dog has an idea that “bum on ground = I get the food”, I lure the dog with an empty hand, pretending that I have a cookie. The dog is now busy watching my hand as it goes up and over his head, and he sits. I click and give him a treat from my pocket or bait bag. The dog now understands a hand signal for “sit”. My fingers pinched together above his head, moving towards his hindquarters is the “green light” to sit. As the dog becomes more proficient, I alter my hand signal to make it more and more obvious that I don’t have food until just lifting my hand up, palm facing up, cues the dog to “sit”. I can then add a verbal cue, if I am so inclined. Becoming dependent on food being visible. This is the number one issue with luring. Owners complain, “My dog only sits if I have a treat in my hand.” The good news is this can be prevented: as soon as you have the behavior, get rid of the food! Re-read my paragraph above: I only lure the dog three or four times before switching to an empty hand. Scaring the dog. Simply put, it is unfair to lure a nervous or frightened dog. For example, when I teach agility classes, new students almost always try to lure their dogs over the agility equipment when the dog is clearly afraid of the obstacle and is not sure what to do. It is only okay to lure a happy, relaxed dog into something he is physically and mentally capable of doing. If the dog is unsure about how to walk on a narrow plank, your best bet is to shape the dog to walk on it literally one step at a time. This will build the dog’s confidence up about that object. Although I do use luring with my students, it is an approach I use rather infrequently with my own dogs. I am patient and possess the timing skills necessary to shape most behaviors with my dogs. 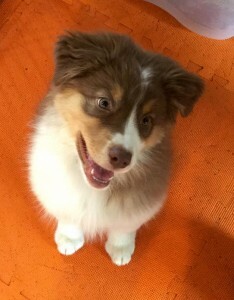 There are some behaviors that I think can be trained faster and more easily with a lure, such as teaching a dog to “spin” in a tight circle, but for most other behaviors (including sit and down) I choose to capture them instead. More on that in my next post! Cricket has been taught to lie on her mat using shaping. 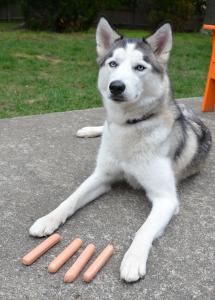 When it comes to positive reinforcement based clicker training, there are four major ways of getting behavior: shaping, luring, targeting, and capturing. There are other ways, including physical modeling, but they have limited applications and are rarely used by most force-free trainers. In this post, I’ll address shaping, and in the coming weeks, I’ll follow-up with the others. What is shaping? Shaping is a method of building behavior “from scratch” by clicking successive approximations towards an end behavior. Often a trainer will create a mental or written “shaping plan” that lays out the steps it might take to get the final desired behavior. One popular way to introduce shaping is when teaching a dog to get on a mat. The goal behavior is that the dog lies down on the mat for an extended period. In the beginning, the trainer will start by clicking and treating their dog just for looking at the mat. This is usually followed by sniffing the mat, brushing up against it, or putting a paw on it, all of which can also be clicked. After the dog has received several rewards for interacting with the mat in this way, they will start to experiment just a little, often by purposefully putting a paw or two on the mat. Click! From there, the trainer waits for the dog to put three or four of her paws on the mat before clicking and treating. When the dog demonstrates an understanding of “paws on the mat = treat”, the trainer patiently waits for the dog to offer a sit or a down. Some dogs offer sitting right away and later relax into a down, while others flop over into a down right away. 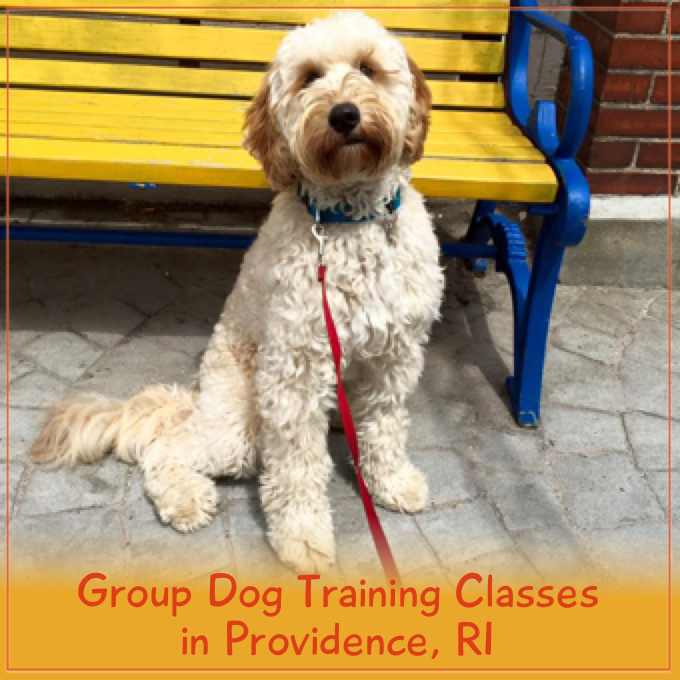 It’s very important to understand that the trainer remains relatively quiet during this process and does not prompt the dog by talking, saying cues, patting the object, or touching the dog. All of these things mean nothing to the dog! He can’t comprehend English and he doesn’t know the desired behavior yet. At best, it’s luring which must be faded later; at best, it confuses the dog and slows down the learning process. 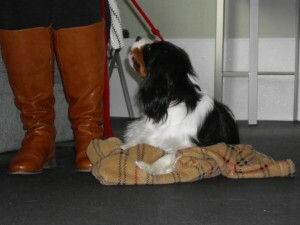 Instead, the trainer should manipulate the environment to set the dog up for success. When I teach group training classes, I tend to work on matwork as the last exercise, when the dogs are comfortable and are a little tired. I have students sit on their mats during class and only take them out when it’s time to work on mat training, and I instruct them to be prepared before putting the mat down. They need to be ready to click the instant the dog starts looking at or sniffing the mat, which is often before it even hits the floor! I recommend that students to practice matwork in the evening when the dog is already considering taking a nap. Sleepy dogs are more likely to lie down on an object than wound-up, excited dogs. The flip side to this, of course, is that if you are shaping a fast movement-oriented behavior like agility obstacles, tricks that involve movement, or coming when called, do it when your dog is awake and full of energy. The cue “sit” was only added when we were willing to bet $10 that this puppy would put her bum on the ground immediately after we said it. What is a cue? A cue is a name or label for a particular behavior. It is the “green light” for the dog that tells it “perform that behavior now to get rewarded”. Once a behavior is on cue, the dog should only offer it upon perceiving the cue. The most common examples of cues in dog training are words like “sit” or “down,” or hand signals that prompt the same behavior. What should I choose for my cue? Cues should be able to be given consistently, perceivable by the animal, distinct from other cues the animal already knows, not confused with praise or other meanings, and easy to transfer to others. Spoken words and hand signals make popular cues because they meet all of these criteria, and that is what we generally use. However, a cue can be anything your dog is capable of perceiving, which allows you to get creative! In our Nosework classes, the presence of a particular odor acts as the dog’s cue to indicate to her handler that she has discovered the source. How do I teach a cue? To start, make sure the dog is offering the behavior consistently. We do not add a cue to a behavior until the dog knows how to perform it without lures or prompts from you. When you are willing to bet $10 that your dog is going to offer that behavior, it is time to add the cue. When the dog performs the behavior, click and then treat. If the dog is in a stationary position, like sit or down, then toss an additional cookie a short distance away so the dog gets up. This treat “resets” the dog so you can cue them to sit or down again. As soon as your dog has finished eating, give the cue again. Continue this sequence of cue-behavior-click-treat several times in a row. After each treat, pause ever so briefly before cuing. If the dog pauses too, immediately give the cue, and click and treat the resulting behavior. If the dog anticipates the cue, do not click or give the dog a treat. Wait several seconds until the dog stops offering the behavior, then give the cue. If you give the cue and the dog doesn’t offer the behavior, wait several seconds before cueing again. I usually count to 10 in my head before re-cueing the dog. I don’t want to fall into the trap of saying the cue over and over again before my dog complies. “Sit, sit, sit, sit, sit!” should not be your goal! Click quickly for tentative offers of behavior, and treat generously for initial successes in new situations. Remember not to click this behavior unless you have cued it. Next, it is time to take this behavior on the road and train in new situations and environments. Practice in different rooms of the house, outdoors, with people present, with other dogs in the room, etc. Happy training! Good puppy socialization requires a bit of creativity. Read on some suggestions for getting your new addition “out and about” in the real world. Remember that when socializing your puppy, your goal should always be exposure without overwhelming him. We want your puppy to experience novel things without getting scared or feeling too uncomfortable. When your puppy is very young (under 16 weeks of age) and has not yet received all of his immunizations, carry the puppy in locations where lots of dogs or wildlife are present to limit the (already slim) possibility of picking up a disease. These places include pet stores and wooded areas or trails. What is loose leash walking? Loose leash walking is an informal leash walking behavior. It’s not “heeling”, which is a precision walking behavior required for obedience competitions, but it can be a precursor to that. While loose leash walking it is acceptable if your dog sniffs, lags behind you, or forges ahead of you a little bit, as long as the leash stays loose. Why does my dog need to know it? 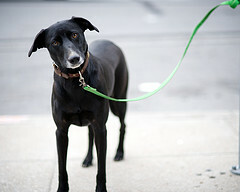 Leash manners are invaluable for all dogs. Imagine taking your dog for a walk around the block, on a hike, or even just out to pee without getting dragged around. 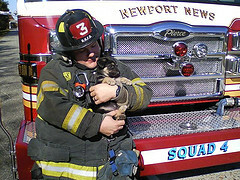 It is also important to teach for safety’s sake – a pulling dog is dangerous on icy sidewalks or steep stairs. Plus, your dog walker will love you for training it! How do I teach it? LLW is a duration behavior. Duration behaviors are taught in tiny increments. Remember, we don’t ask for a 15-minute sit stay right off the bat, so we don’t ask for 2 minutes of perfect LLW immediately either. Start teaching loose leash walking in a quiet, neutral environment like your living room or bedroom. To teach it, shape it step-by-step: take a step forward, and click and feed your dog a treat right at your side before your dog has the opportunity to sniff or wander off. Take another step, and click and treat for the same behavior. Repeat. 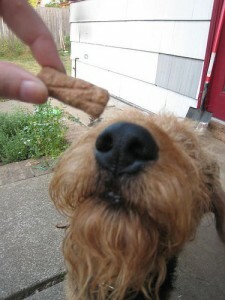 If at all possible, try to feed your dog in motion, without stopping, when giving the dog a treat. It builds the behavior faster. Also, make sure treats are soft and very tiny so they can be eaten quickly while the dog is moving. Gradually work up to taking two steps before clicking and treating. Then three steps. Once you have worked up to three steps, randomize how many steps you take before clicking and treating. Don’t always make it harder and harder (for example, 5 steps, 6 steps, 8 steps) because it reduces motivation. “Ping-pong” it by randomizing how many steps you ask for (3 steps, 1 step, 5 steps, 2 steps) for the best results. By varying the duration in this manner, you can work up to longer periods of LLW without losing your dog’s focus. Remember that loose leash walking on a busy road or near the dog park is a lot harder for your dog than doing it in your backyard. As a result, be sure to decrease duration back down to 2-3 steps per click in exciting environments, and use high-value, super tasty treats when working near a lot of distractions to ensure your dog is successful. Loose leash walking is a hard behavior for dogs to learn – do not ask for too much too soon! It takes weeks of training to teach this behavior reliably, so be consistent and practice often. We recommend that owners purchase a front-clip harness, such as the Freedom harness, and use that while taking their dogs for walks while the dog is still mastering LLW. Front-clip harnesses discourage pulling by gently turning the dog back towards you if he pulls. It is much harder for a dog to pull you anywhere when he is wearing a front-clip harness. Head halters can be used in a similar manner. Regardless of the equipment you decide to use, success comes from using a high rate of reinforcement to reward the dog for staying by your side and not rushing forward. Happy training! What is “Get on the Mat”? The dog learns to relax on a ‘mat’ – a specific towel, blanket, or dog bed. This mat can be moved to any location, like your kitchen, the vet’s office, or the car, and your dog will know to stay on it and relax. Why does my dog need to know it? 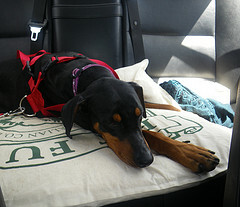 Getting on a mat is a great behavior for dogs that are “on the go”. Dogs that know a mat behavior can be taken anywhere, because they will be able to settle down and relax once they get there. Their owners are then free to enjoy themselves and not have to worry about what their dog is getting into. 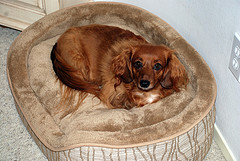 A mat behavior is also excellent for dogs that are a nuisance when visitors arrive to the home. Whether the dog is barking, jumping up on guests, or bolting out the front door, laying on a mat is an easy-to-teach behavior that is incompatible with those actions. How do I teach it? First, choose your mat. This can be a towel, bath mat, fabric placemat, carpet sample, or dog bed. (In the future, you can generalize this behavior to other mats. Initially, use the same mat each time you train.) Next, get out your clicker, and prepare some tiny, soft, tasty treats that your dog really enjoys. Sit on the floor, and place your mat in front of you. When your dog approaches, click and toss the treat on the mat. Then, click and treat your dog several times just for being on the mat, placing the treat either on the mat or directly into his mouth. Next, click and throw the treat off of the mat. (This “resets” the dog to approach the mat again. This is a two-part behavior: the dog needs to get on the mat, and then stay on the mat.) Click and treat when your dog gets back on the mat. Once again, click and treat several times, and then click and throw the treat off of the mat. Now move the mat just a couple of inches away from you. Again, click and treat when your dog gets on the mat, repeat several times, then click and throw a treat. Move the mat again. Keep moving the mat a few inches at a time so your dog learns to look for it no matter where it is placed in the room. Once your dog is reliably getting on the mat anywhere you put it, take it to other places in the house, in the yard, and even in the car to help cement your dog’s understanding of the behavior. Next, shape for relaxation by rewarding sits, then downs on the mat. Delay your clicks to build duration one second at a time. Once the dog is consistently offering to lay down on the mat, encourage relaxation by giving the dog a favorite chew toy or bone on the mat, or by doing gentle, relaxing massage while your dog hangs out on his mat. Happy training!